I'm not sure why this interesting fish looks so glum. He's freaking cool. And he hasn't been altered by science. Those red lips are permanent. 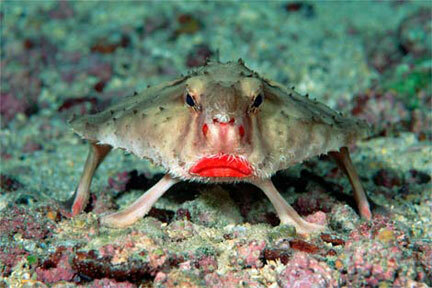 Hence the name Rosy Lipped Batfish. The lips aren't the only thing weird about old batty. It walks on it's fins which are modified to work like feet. As it walks/glides on the ocean floor, its dorsal fin is shaped like a single spiny projection to lure prey. It also has a lure on top of its head for an unknown purpose. I hope it's enough to keep the folks at Revlon away. You can find the rosy lipped Batfish in the waters around Costa Rica. But beware, they apparently hate globetrotting Austrailian snorkelers. said Miss Cellania on July 9, 2009 3:12 PM. said Rando Aces on July 9, 2009 3:20 PM. Send us pictures of whatever odd creations you see. said Baierman on July 9, 2009 3:46 PM. said Eddy on July 9, 2009 5:16 PM. said E on July 9, 2009 5:41 PM. You'd look glum too, if all the other fish called you the "dirty crackwhore of the sea". said Your Mom's New Boyfriend on July 9, 2009 7:53 PM. said Vicky on July 10, 2009 11:12 AM. you know, you guys can poke fun at this all you want but lips don't get that red for no reason. i'm thinking there is more to this story. ALOT more. said phatlard on July 10, 2009 11:32 PM.